Home Mobile What Is The Best iPhone Twitter Client? What Is The Best iPhone Twitter Client? If you’re looking for the ultimate Twitter application for the iPhone, look no further than TweetBot for iPhone. If the wonderful makers at Tapbots, TweetBot is one of the most powerful iPhone, iPad and iPod touch applications as an alternative to Twitter’s official mobile app. Though it’ll cost you $1.99 in the app store, it is well worth it. TweetBot offers a nicely designed user interface and a powerful set of features. After purchasing the application for the first time, TweetBot offers a quick tutorial to learn the powerful features of the application. 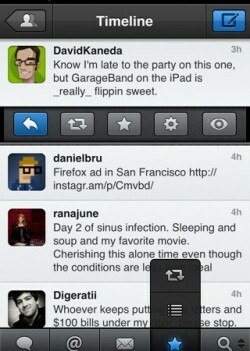 From there, TweetBot brings you to your timeline which shows you a clean look of all the tweets in your public timeline. At the bottom of the screen, we see a navigation bar that offers an array of navigation through the app, including menus for tweets that mention you and direct messages. On the far right side, the last two buttons offer you to tap and hold them to reveal more features. Between the two buttons you can navigate between four sections, including lists, favorites, retweets by others and search. To quickly and easily track down tweets, the application features a search bar at the top of each page to search content or name in a tweet. Additionally, the app can alert you with a sound to alert when the timeline is updated. As with many other apps, you can set up multiple accounts and timelines to suit your needs. To interact with a tweet, you can tap the specific tweet and bring up an interaction bar under it. With several options, you can respond to the tweet, retweet or quote it to your followers, copy or email it and save it as a favorite. This allows for quick interaction with a tweet to cut down the time needed to interact with it. Alternatively, if you double tap the tweet it will being up statistics about the tweet in more detail. Also, double tapping the users picture will bring up information about their account. And double tapping the URL loads its link in the internal web client. For an added bonus, you can customize a triple tap for your needs. All of this may seem confusing, but everything works together seamlessly and will seem natural when you use the commands. Overall the application is amazing, with a quick, clean and user-friendly UI it is the perfect for the heavy or casual twitter user. TweetBot uses an array of settings that you can customize to an endless extent. The variety of options include changing the font size, display name, which URL shortener and image uploader you want to use. TweetBot also allows you to access your own account information to view your followers, and who your following and tweets that you sent you recently, you can even go as far as to edit your account details within the app. The only down side that I see, is a lack of landscape mode. This feature is a must need for people when reading web pages from within the app. Overall, TweetBot is by far one of the most amazing apps that I have reviewed. Out of all the free and paid options for Twitter clients, TweetBot comes out on top. For both the casual Twitter user and even power user, TweetBot will quickly become a permanent spot on your home screen. Click Here to find TweetBot in the app store.